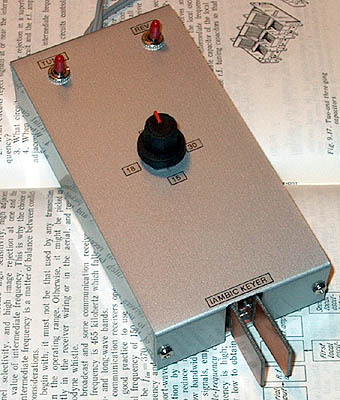 Iambic keyer with simple paddles and simple electronic circuit. Very simple iambic keyer with only two chips! This circuit is not designed by me. Once it was published in a Ham magazine (I really can't remember which one) and I never saw it again. I made the first keyer in 1980 and the second one in 1999, so it is an old but a very nice design and it deserves to be published more often. Jaques F6TEM was so kind to give me more information: This design is from HB9ABO, page 70 on Ham Radio January 1979. I think that I had it from this publication! And Andrew ZL2PD, was also so kind to give me more information: it was also published in Sprat nr 69 on page 17 (winter 1991) by Pierre, FE1MOG and republished more recently in the RSGB book, "Low Power Scrapbook" (on page 195). The errors in that publications are: missing ground connections on IC2B pins 9 and 12. It is my preferred electronic key, it is simple and works fine. The only item that was added are the two transistors, so that the paddles are grounded and the 100k ohm resistor directly on Pin 2 for better RF immunity. Use a screened cable for the connection with the transmitter. An iambic keyer has two paddles, one for a dot and one for a dash. The dash is with your thumb, the dot with your finger. If both paddles are pressed, a dash-dot-dash-dot pattern is transmitted. Extra options are a switch for tuning (one paddle is directly connected to the key input of the transmitter) and a switch for reversing the paddles for left-right hand use. Although it is a simple key, the way it works is not so simple. Try to find it out by yourself! to avoid RF immunity problems in the circuit when using high power. "I built the little 2 chip keyer, but had a very difficult time getting it to work. It would always shorten the first dit or dah when used. I finally tracked it down to the capacitor in the clock circuit. I originally used a ceramic disc capacitor which had too much leakage. I replaced it with a mylar film capacitor and the keyer works great. So a film capacitor works best." 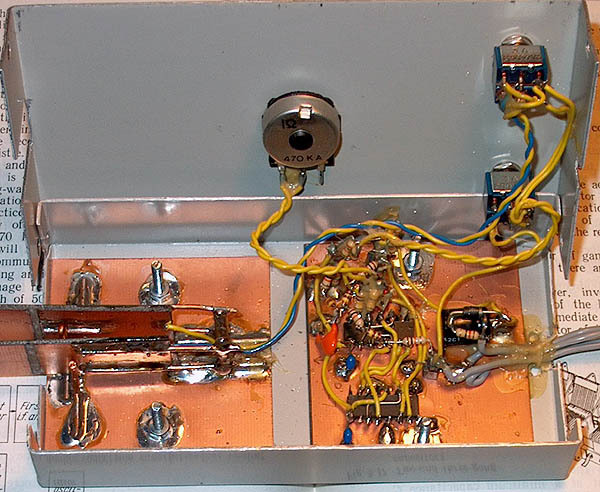 It is a nice, simple keyer for QRP use. The supply current is 2.5 mA at 12 volt and only 0.7 mA at 5 volt. When none of the two paddles is activated, the current is only 1uA! An on/off switch is even unnecessary! Four AA cells or a 9 volt battery is sufficient for hundreds of hours of use. One minor point is that the dot-dash proportion is not exactly 1:3 but 1:2.8 and the dot-space proportion is not exactly 1:1 but 1:0.8. In practice this is not noticed however. The speed is based on the specification that the dash is exactly 300ms at 12wpm. This can be measured with the use of an oscilloscope. For 15wpm, the dash is 240ms, 200ms for 18wpm, 150ms for 24wpm and 120ms for 30wpm (maximum allowed CW speed in The Netherlands). The paddles are made from pieces of double sided PCB and copper wire. 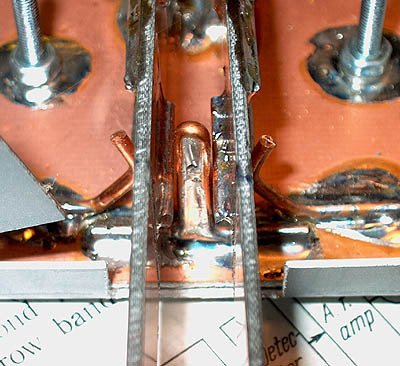 The copper wire is used as contacts, as supports and as the hinge and spring. The parts you touch with your fingers are isolated for safety reasons. It is a simple construction but performance is good. Another more modern solution is an old mouse. Only the switches are used, the electronic parts can be removed. The dot button is pressed with your forefinger, the dash button with your middle finger. After some practice, I could use such a mouse with success. Such a mouse is perhaps also a good solution for mobile use. 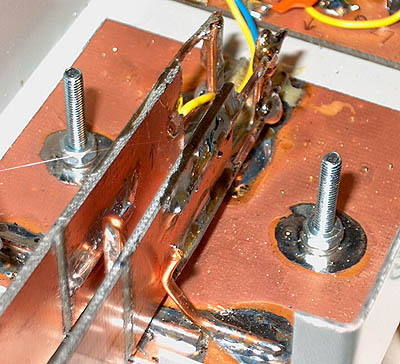 Center contact is ground and copper wires soldered on paddle are the other contact. strips are cut away. Contact distance is adjusted by bowing the outer supports from copper wire. The copper wires at the back of the paddles are the hinge and spring, I took 1.5mm2 as 2.5mm2 was too strong.